One of the best known features of Trelissick is its collection of Rhododendrons which come into their own in Spring. Many of them continue to flower into late Spring and we were able to enjoy these, the very essence of a Cornish garden it seems to me. One of the best Rhododendron species to grow well in the upper part of the garden, where the ground is thinner and drier, is the rich red ‘Gwilt King’, a hybrid of Rhododendron griersonianum. When a touch of sunlight catches these flowers, they seem to glow. There were still plenty of new flowers to come even in mid June. 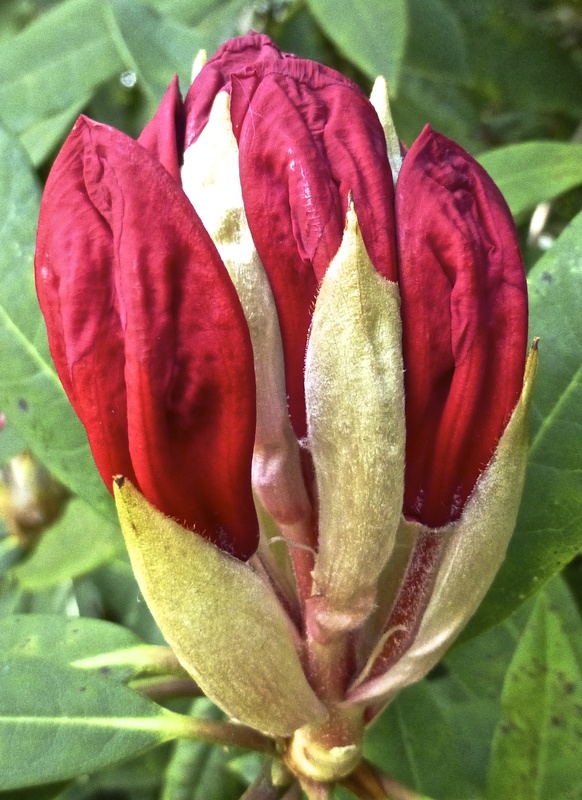 Rhododendron buds are elegant and deserve just as close a look as the more showy flowers. Along the Rhododendron walk, we found this moss covered seat. Whenever I find such an empty seat, I’m reminded of UK friends who enjoyed exploring gardens with me in years gone by but who are now no longer here for me to sit and have a chat with. I love the memories of the good times we spent together in gardens such as these and am grateful for those special times of friendship. Walking on, we found several other Rhododendron species in flower. Many of these were brought to Trelissick Gardens from the famous Bodnant Gardens in north Wales by Ida and Ronald Copeland when they lived here. I don’t know their species names but each and every one of them was a delight. I hope you enjoy our photos of a selected few of them. As well as Rhododendrons, there were still some azaleas in flower. My favourite is the Mollis Azalea. It reminds me of my wonderful Mum! Other trees in flower were Cornus, or Dogwoods. Have you ever really looked at the centre of a Dogwood flower? In amongst the borders are plants like Aquilegia, cottage garden and border essentials with their delicate nodding flowers and delightful lacy foliage which is a rare blue-green colour. They are a beautiful foil for other larger, heavier plants and , although the fresh foliage starts growing in early spring, the flowers develop just in time to fill in when spring flowers begin to fade. They are commonly known as Columbines or, a name I love for these beauties, Granny’s Bonnets . This delicately petalled Roscoea cautleyoides is another Asian plant that’s grown in this garden. Although it’s a member of the ginger family, which has mostly tropical species, this plant comes from the mountain regions of Sichuan and Yunann provinces. Another delicate white flower is the bell of Polygonatum or Solomon’s Seal. Once classified as a member of the Lily family, this plant is now classified as a member of the family Asparagaceae. It’s hard to keep up with these classification changes at times! Most Cornish gardens make some use of the lovely Astrantia along the borders of the garden. The flowers range from white to a deep wine red. If we look closely we’ll see that this one has a visitor – a tiny green beetle. Another plant used to great effect in this garden’s borders is the Geranium, commonly known in UK as Cranesbill. I love the veined petals. There are many colours for gardeners to use and they flower for a long period. A flower that adds a wonderful dash of colour to any border is Alstroemeria commonly called Peruvian Lily. Time was getting away from us and, reluctantly, we followed this man and his grandson back to the carpark. I hope they had enjoyed their Trelissick experience as much as we had done. But we still had a long way to go to Sennen Cove near Lands End where we were to stay for the next three nights. Apart from visiting a quiet Cornish beach for the weekend, our goal in going to that southern part of Cornwall was to learn more about the kind of lives lived by David’s forbears working in the tin and copper mines from the 1600s to the 1850s when some of them made the big decision to emigrate to Australia. More of that story anon.